So you just had an experience of fishing on a Kayak? Or you watched somebody getting loads of catches on Kayak? Maybe you are struggling to catch fish in your Kayak? Possibly You bought a fish finder that made load almost impossible to handle? Whatever might be your situation this list of best fish finders for kayaks will help you sort out your problems. When reading this list we assume you have already bought a kayak. If you are planning to buy then little advise would be to buy a kayak which is stable and has curves that can withstand the sharp curves. A key point is that your beginner kayak should be lesser streamlined and has reinforced hulls. Here is an excellent resource for best fishing kayaks that can make your life a lot easier in the selection process. But if you already have a kayak then keep on reading. We have compiled the best fish finders for kayaks keeping in mind space, portability, mounting, size, GPS. With a wide variety of fish finder available, it can be a problem to understand features and differentiate between similar yet different models. This guide will help you understand each kayak fish finder and help you choose the best. The most portable kayak fish finder in this list. It has no image processing receiver for transducer rather all processing is done by a 6.5cm ball which acts as a transducer. It is very portable as you do not have to mount the transducer. Attach the deeper smart pro with your fishing rod or with a tandem and throw it in the water. It works on Wifi and Bluetooth. Wait for Wifi? That is what a router does. So am saying you buy a router and do all the cables ordeal? Wrong. Deeper Smart Pro has changed fishing when it went wireless, it has its own inbuilt Wifi transmitter. All the scanning done by the transducer rubber ball is transmitted to the nearby 130feet range. So where is the receiver? Well, take it out from your pocket. It is your smartphone which is the receiver. Open your smartphone go to Apple Store or Google Play store and download the Deeper Smart Pro. Now when you are at your lake, doing fishing on your kayak and you have already thrown deeper smart pro into the water. Slide open your cell phone, turn off the mobile data and scan for wifi sources. You will find deeper smart pro signals, connect with it. Open the mobile app now from deeper smart pro and you will start seeing the digitally processed images. So a big fish finder display screen is out of the question. Your display or receiver unit is your mobile phone which you would have had anyway. The space for mounting the fish finder is saved. Another plus point you don’t need a battery as well because we are assuming you are using a fully charged mobile phone and know how much it will last. So, you saved the space again. But all that glitter is not gold. There are downsides to carrying this most portable fish finder which made in to this list of best fish finders for kayaks. It has a range of 130feet. Yes, it is a big negative if deeper smart pro floats further away from this distance you will lose connection. The other negative is that it only comes with Dual Beam 2D 290/90Khz technology. You don’t get down imaging or side imaging and in this price range, you could have got more technologies as well. Third, the charging lasts for only 6 hours which is reasonable but you cannot go for a long day fishing. Smart sonar pro comes with an integrated GPS. But do not get carried away it’s just a Bathymetric mapping facility. Bathymetric is the mapping of terrain submerged in water. So, when you use the smart sonar pro in water it will make recordings of the bottom and will get stored on your smartphone. You can save, access and share the terrain and use it later. A very portable kayak fish finder. Like Deeper smart sonar pro this military-grade fish finder works wirelessly. Considering the space constraints on small kayaks it is the prime reason why it makes in to the list of the best fish finder for kayaks. It does not work on Wifi rather it works on Bluetooth. The principles are the same throw this small rubber ball with a fishing rod or with a tandem. Wait for processed images onto your mobile phone. You will need to download the app for your IOS or Android phone. FishHunter provides a charger for this device so you can charge it fully from home or with a battery on board. The battery lasts for 8 hours so you can plan a long day fishing. It also comes with GPS which you can employ to navigate and save important fishing points. So, you don’t have to struggle to find great fishing spots in the same lake again. So you are planning to buy it? Consider these cons first. It is a Bluetooth device. Bluetooth has more connectivity issues. If you have used an old-school Nokia phone use, remember the days when you transferred data via Bluetooth or play a multiplayer game? Keep in mind you can suffer same connectivity issues especially in cold weather where Bluetooth is more prone to signal strength problems. Secondly, you cannot enjoy the range of wifi which is 130 feet. Bluetooth range is slightly more than double of that. It is only 80feet. Beyond that, there will be no signal strength. Thirdly it only scans at one high frequency of 380Khz. This means ever lower scanning depth up to 100 feet of water. So if you have planned to buy wireless kayak fish finder then deeper smart pro is a clear winner among these two. Read this if you want to have a beast kayak fish finder in your arsenal at the expense of space. 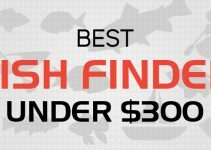 This is one of the best kayak fish finder in this list. It is only 4.3 inch in the display with pixel matrix ration of 480 x 272 pixels. The display size is below 5 inches and the pixel matrix is well above the minimum 240 x 160 pixels’ critical point. What makes it great is the color display. Yes, the receiver displayed processed images are colored. No internal fogging is assured and you can take it into misty lakes. The unit comes along with inbuilt GPS and has inbuilt maps for most of US Inland Lakes, rivers and coastal maps. It is also compatible with Navionics Gold, Navionics Platinum, Hotmaps, SonarChart, and C-MAP. You can store a large amount of waypoints, tracks, routes on this device and can also chip in an SD card through one MicroSD slot. 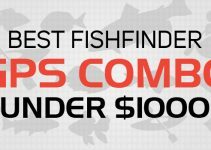 If you are interested in GPS Combo Fish Finder under $500 then you may check other depth finders we have reviewed in another post. Unlike Deeper Smart Pro and FishHunter Fish Finder rubber balls, this is a sophisticated transducer which is one of the prime reason it makes into the list of best fish finders for kayaks. It is a Dual CHIRP model. It employs traditional CHIRP and Dual Beam CHIRP. You can view results on the screen in split screens. What difference does it make? Well, you can look way deeper into water than with the deeper smart sonar or fish hunter fish finder. With Down Vision, you can scan 600 feet while 900 feet can be scanned with conventional CHIRP. You need to power the receiver and transducer with a 12-Volt DC supply from the boat. So you think all is Gold and going to buy this? Well, consider these downsides as well. Its 4.3-inch screen you have to mount it on a mounting bracket and manage the cables. Secondly, you have to mount the transducer on transom mounting on your kayak. You can try other mounting methods as well mentioned at bottom of this article to manage space though. Third, you must power the machine. So, you need a battery to provide 12-volt direct current supply. Manage battery space on your kayak and ensure that all the cables network is 100 percent waterproof. 3.5-inch colored display with a pixel ratio of 480 x 320 pixels. It is smaller than Raymarine DragonFly but so it is the price. But it takes to lead from Raymarine in terms of the unit dimensions as it is only 4.9 x 7.3 cm); 3.5” diag, (8.7 cm). Raymarine can be considered as a 5.7inch cube. So, you can save more space by using this Garmin fish finder. You can mount the display the unit of tilt/swivel mount. It operates 77/200Khz Dual beam CHIRP. Dual beam CHIRP scans the water and presents football field sort of structure onto your display unit screen. This fish finder although makes into a list of best fish finders for kayaks but does not offer traditional CHIRP. But it can still scan 1600 feet of depth in fresh water. It is pretty much enough for your fishing day. It is a fish finder GPS combo but it only includes chart plotter where you can have your current position and drop waypoints to mark good fishing spots. The transducer works have to be mounted on transom mount. But you can try other mounting methods as well. If you are interested then read other mounting methods at the bottom of this article. Although it offers lesser scanning technologies but the good news is you do not need to buy a big 12-volt battery. Indicating you do not need to make waterproof arrangement for cables on your machine. Instead, it uses 4 AAA batteries that will last for 6-8 hours. So, in comparison with Raymarine, its lags behind in terms of screen size but that adds to its portability. It lags behind in terms of offering scanning technologies but Dual Beam 77/200Khz also works great. It takes to leap from Raymarine in terms of unit dimensions. This fish finder is smaller in overall device size and will take space. Also, it comes with rechargeable battery along with 4 AAA batteries so you can save space by making 12 Volt DC battery arrangements. 3.5-inch screen with a pixel ratio of 320 x 240 pixels. In comparison with Garmin and Raymarine models reviewed above it is lower than both of them. Screen resolution is still better than minimum 240 x 160-pixel minimum requirement. In addition, backlight LED display is also present to cover this shortcoming. It is different from both Garmin and Raymarine models in terms of the technologies this model is equipped with. Humminbird provides Side Imaging, Down Imaging and Dual Beam with this model. The results can be viewed on the 3.5-inch screen in form of split screens. The model can also support Quadra Beam but you would have to buy an additional transducer to avail its results. Side and down imaging can scan a maximum of 100 feet. But it can provide deep scan from dual beam’s 1500 feet depth results. This is a GPS combo kayak fish finder. It includes in-built maps for US Inland Lakes, rivers and coastal areas. You can store 2500 waypoints, 50 routes, 50 Tracks and 20000 points by the help of an SD card. Although it lags both Garmin and Raymarine in terms of screen size, provided technologies but it’s very important to note that Humminbird boasts the friendliest user interface. If you are troubled with complicated operating systems then Humminbird is easy to use and will make your life easier. You can mount display unit with both gimbal and in-dash mount. On kayak choose dash in mounting as that will take up lesser space. Transducer mounting is by transom but other mounting methods are also mentioned on this page in transducer mounting section. You have to manage space for battery and do the waterproof arrangement. The smallest 2.4-inch display. If size does not matter to you and you have a perfect vision then 2.4 display is still readable. It is an entry-level fish finder and is meant for either beginners or someone with a budget. The good part is the display is small but it is colored. Display pixel resolution is at critical point safe pixel ration of 240 x 160 pixels. It works on 4 AAA size batteries that can last for 6-8 hours. Depending on your usage you can either buy a battery charger or have backup set if you are planning a very long day fishing. So, you can save space by keeping a big 12V battery in your kayak. The product dimensions are also on the small side. It is a dual beam 200/83 kHz sonar and can measure the depth from 2 feet to 240 feet. This kayak fish finder can measure depth at 1/10th of a foot. Operates at both Celsius and Fahrenheit. The operate-able temperature is -20 to 70 degrees. Although it is an entry-level machine assured to be waterproof but it would be smart to keep it in the plastic bag in case of fogging. For a kayak, you can mount it on your kayak hull. Clean the bottom and stick the transducer there. Make sure there is some water in there for the transducer to transmit sonar. It is an entry-level machine and does not provide the perks of GPS. Although it is safe to do saltwater fishing but it is not safe to drift on shoreline without GPS especially for beginner kayak angler. Kayak is low in space and you need to optimise your space and equipment. If you buy a big fish finder from 5 inches or above then you will have the ease of viewing what is under your vessel but the problem is how are you going to manage such big device? You have to do fishing probably with a fishing rod, keep the battery in place, keep electrical connections right with a waterproof covering, mount the transducers and then you have this 5-6-7 inch device in your hand just for the big screen. Is it really worth it? Do keep in mind you can zoom in even with split screens on smaller screens. You cannot compromise on the other parts but you can cut down the screen size and it is still going to work. After all its kayak fishing, you are doing it for fun, not for living. Therefore, in this list of best fish finders for kayaks look for most convenient screen size you think is handle-able. Most of the Kayak Fish Finders support transom mounting. Transom mounting is very common but on kayak its difficult to adjust as it is a permanent mounting place. For a kayak fish finder you would want more user-friendly mounting. Something which is more convenient, easier to install, take off and reinstall. Even something permanent which remains intact will be great to ensure user-friendly experience. Apart from transom mounting read below for some more mounting ways on your kayak. An interesting mounting technique used by some kayak anglers is Hull mounting. Open the hatch and clean the hull as much as possible, no sand, no dirt, no bubble, no residue or anything should be left in the hull. Any dirt in there will cause trouble in attaching the transducer there and will not give optimum performance. Hull mounting can be difficult because of pipes and other boat equipment lying in the hatch. Depending on the type of boat it will take 5-30 minutes to clean. Clean the transducer as well so there is no debris on transducer too. Once its cleaned up use transducer epoxy and spread it on the bottom side of the transducer. Make sure that the epoxy is at least 6-degree temperature so it adheres well. Open the hatch again and place the transducer is newly cleaned hull. If there is any dirt left it will not stick perfectly. Hull mounting can be tricky but don’t lose hope an easy way to mount transducer is by magnetic mounts. Open the hatch of your kayaks and then place the magnet on the inner side of the kayak. On the outer side of the boat, the metallic transducer will stick with the magnet on the inner side of a boat. Now by extensions, bolts etc. you can manage the length and you are done with mounting. Another way is to run a pipe through your Kayak scupper and then place the transducer in that. The fourth way is Lowrance suction cup mount (insert link here). It is as easy as it sounds, simply attaches the suction pipe to the side of your kayak. Do the nut, bolt, extensions action. You are ready for scanning! It is worth noting that Humminbird has teamed up with Necky, Old Town Ocean and have made their scupper holes compatible with their transducer. Same is done between Lowrance and Hobie – Wilderness kayak makers. So if you already own a kayak then stick to these brand compatible kayak fish finders. After reading these methods now consider the common transom mounting. How difficult it is and is convenient for your Kayak fish finder. The transducers which come up with these kayak fish finders have to be manipulated to match these mounting methods. In this list of best fish finders for kayak use any of the method you find the easiest and make your life easier. It all depends on your style of fishing and your location. If you fish in your nearby lake which is presumed to be small then you do not need GPS. If you can afford some extra bucks then go for the GPS combo fish finder even if you fish in a small lake. GPS will add to the value and can help you mark great fish spots with pinpoint accuracy. If you change your lakes or try little shoreline fishing then you should not compromise on GPS. It’s an excellent feature and can save you from unnecessary trouble. You kayak can be drifted away far from the shoreline or you might get lost even in the inland lake. After all, there are lakes of all sizes out there. It is just too risky to go alone without knowing how far you have gone. Lastly, imagine the number of points you can drop on your lake to save great fishing spots. If you have drifted to a spot where you have not been before and there are loads of catches residing there then with your kayak fish finder you can save the route. Next time you can follow the same route which will lead to the same spot. There are a lot of things you can do with GPS these are just some of the necessary points. There are two kinds of kayak fish finders. One which has their own AAA batteries or of any other size. The second type which takes power from a 12VDC source or very rarely from 110/240 V source. In the first case, you only have to take stress for the wires and much of your kayak space is left for good use. But the problem with these kayak fish finders is that the batteries last for 4-8 hours depending on your budget. So, you would either must recharge the batteries and buy a battery charger or you need to buy a new set of batteries. It is a repeated expense. The second type of kayak fish finders which takes power directly from the power source is good in saving from repeated charging and battery expense. But this type has its downside, you have to buy a power source if your kayak does not have a built-in one. Manage wires, make sure that the assembly is totally waterproof and last manage space! Both types have their own pros and cons. It depends on your style, kayak size, and budget. If you managed to read all the details and read the points to consider important factors, am confident you are clear in your mind. 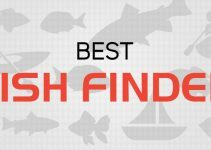 This detail list of best fish finders for kayaks has different companies’ models. All models are under 5 inches and have been chosen deliberately to decide to meet the need of a kayak. It all depends on your preference if you are a beginner kayak angler then deeper smart pro can prove to be very handy. It is manageable and for newbies who still have not mastered to control a kayak, it can ensure safety and fun. But if you feel more confident in your kayaking skills then look for Raymarine or Garmin or Hummingbird. Each has its own pros and cons and depends on your budget. If I had to choose then I would go for Raymarine Dragon Fly its providing CHIRP both conventional and dual beam. CHIRP is a game changer and is better than usual dual beam sonar. However, if you do not like difficult screens, too much-complicated interface to handle then Humminbird kayak fish finder is the right choice. It is a proven track record and is known to be the friendliest when it comes to fish finder irrespective whether kayak or some other vessel. Although it’s not CHIRP but down, side and dual beam also give you access to everything underneath your kayak. If you are low on budget and can compromise on quality technologies and need to know where to fish only. Then Signstek FF-003 can be your helping hand. It is small and portable. Operates on long-lasting batteries and importantly the small screen has colored display. You do not get the perks of CHIRP but you can still have the Dual Beam sonar benefits. Once you have taken the decision the fun Is only about to begin. Forget the old-school ways of fishing and get into the modern era. It is an amazing feeling when you hear the fish alarm from your fish finder telling you that you at right spot. Fishing without a fish finder is like fishing without eyes. The kayak fish finders are worth investing money into and you will realize the benefits once you use it yourself. I love the way you explain to go around the magnetic mounting instead of the transom. I gotta try that out. What kind of magnets are those? Can I buy them on amazon? Do you have a link, please?